Our winner: Brent Bozell, Media Research Council, goes on the Hannity and Colmes fiction hour, again, to announce about Senator Clinton, quote: "Now we know and we know -- we knew that she was in the middle of things, we knew that she was behind the whole FBI-gate." Yeah, in 2000, the last Whitewater independent counsel, Robert Ray, wrapped up six years of investigations and announced that, quote: "No senior White House official or First Lady Hillary Rodham Clinton engaged in criminal conduct to obtain through fraudulent means derogatory information about former White House staff. No senior White House official or Mrs. Clinton was involved in requesting FBI background reports for improper partisan advantage." Independent counsel Robert W. Ray was a Republican and Brent Bozell is a guy who makes stuff up. 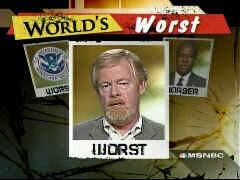 Brent Bozell, today's Worst Person in the World! It would seem like a good argument for the lefties to cite an independent counsel document to absolve Hillary of any involvement in the FBI files scandal, even if it’s odd considering that Hillary always vehemently opposed the idea, and regularly trained her corps of attack dogs on independent counsels as a shamelessly partisan cog of the Vast Right-Wing Conspiracy. Clearly, Robert Ray’s (and Kenneth Starr’s) office investigated the FBI files matter and brought no criminal charges. But as usual, the Clintons always suggest that if they’re not indicted, then they have "done nothing wrong." They would say that even if they were indicted. But when special prosecutor Patrick Fitzgerald declined to indict Karl Rove in the Valerie Plame matter, Media Matters certainly didn’t find that Rove was then free of suspicion. Instead, they demanded the removal of his security clearance. Would Olbermann suggest that since Fitzgerald didn't indict Rove, his script writers at Media Matters were "making stuff up" about Rove's role in Plamegate? If Clintonistas think that Rove shouldn’t have a security clearance for their feeling that he violated Plame’s privacy and CIA employment, then why would it seem odd for Hillary’s opponents to suggest that her suspected role in violating the privacy of Republican White House employees, or her providing "factually false" answers to a grand jury, suggest she shouldn’t be president? On September 25, 1996, Senate Judiciary Committee Chairman Orrin Hatch (R-Utah) revealed a six-month gap in the log which listed who at the White House was accessing FBI background files on Republican White House employees. The Washington Times bannered the news across page one the next day. On October 4, Sen. Hatch released the deposition of White House aide Mari Anderson before the Judiciary Committee. Anderson verified that pages of the log used to record the taking of FBI files were missing. Anderson also asserted, contradicting White House aide Craig Livingstone's assurances, that Livingstone knew the Clinton White House was procuring the FBI files of Republicans. Even The Washington Post put this story on its front page the next day. Network coverage? One brief on "Good Morning America" (and we found two briefs on CNN).